Last month on an appropriately rainy day in New Orleans I had the opportunity to tour the Lower Ninth Ward, one of the areas most affected by Hurricane Katrina in 2005. I was amazed by the resilience and dedication of those involved in rebuilding. Five years later large spray-painted “X”s still adorn many doors indicating all residents have been evacuated and have not returned. There is still a long way to go. 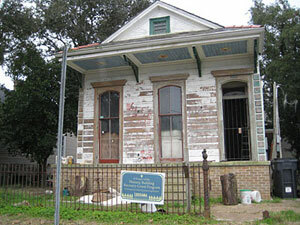 The Preservation Resource Center has done a great deal of work in the Holy Cross Neighborhood in the Ninth Ward. Since Hurricane Katrina, Operation Comeback has invested $2 Million in purchasing, renovating and reselling vacant historic properties to help restore and repopulate the community. While it is estimated that 100% of the buildings in this area were damaged by Katrina, because of the elevation most buildings are still standing and many are candidates for restoration. When buildings cannot be saved, the PRC heads a salvage program that saves reusable ornamental items such as mantels, doors, windows and wrought iron. We had the opportunity to visit the salvage warehouse… a candy store for designers and architects! Here preservation and going green work hand in hand. 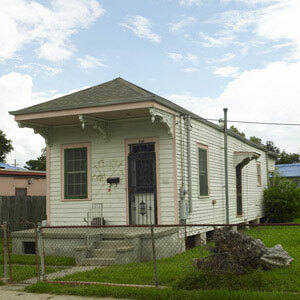 The shotgun house restored on This Old House. In addition to viewing much of the restoration work of the PRC in this neighborhood, we also got to see the shotgun house that was featured in This Old House. This restoration is an oasis in a still very damaged neighborhood. In the northern edge of the Lower Ninth where the Industrial Canal flood wall collapsed and pretty much everything was destroyed something completely different is happening. Brightly colored contemporary structures dot the landscape that is now a large construction zone. 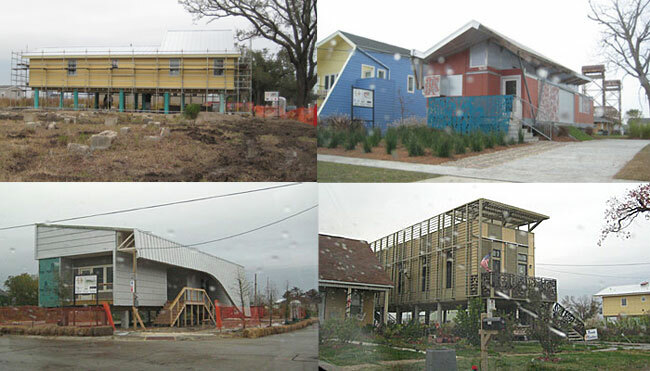 Frustrated by the slow progress in rebuilding, in 2007, Brad Pitt set up a foundation called Make it Right and invited 13 architects to design sustainable contemporary homes based on traditional the New Orleans “shotgun” and “duplex”. The criteria given was to “use the city’s existing narrow lots (that is, no aggregating lots and building large complexes—rumors had circulated after Katrina that Donald Trump wanted to buy the whole Lower Ninth); elevate houses out of the way of future flooding and include rooftop access to simplify rescue; feature prominent porches or front stoops for socializing; and use materials that are tough enough to survive hurricanes but that also approach “cradle to cradle” reusability. The standard house was to be 1,200 square feet, have three bedrooms and two baths, and cost no more than $150,000. Homeowners would pay what they could, and the foundation would help with the rest.” (Wayne Curtis, The Atlantic) One design by architect Thom Mayne even created a “float house” that will float upward up to 12 feet in the event of flooding while guideposts will keep the home from floating away. The resulting designs are groundbreaking and unlike anything in the area. The initial plan is to complete at least 150 homes. I got the sense from locals that they wish this had been done as more as a joint effort with local planning groups, but New Orleans clearly needs all the help it can get and it will be interesting to see what kind of community emerges here. Four very different contemporary structures that are part of Make it Right.